If your needs are simple and you're content with a machine which happily lets you create documents, reports and presentations, the MSI X340 may be just the machine you're after. MSI has managed to squeeze the components into a truly thin and tiny chassis, providing one of the most portable laptops around. The slim chassis weighs just 1.4kg, making it ideal for transporting it around the workplace or university. At just 21mm thick, it'll slip conveniently into almost any bag or sleeve you may have. The three-cell battery does a reasonable job when working on the move, and you'll easily get more than four hours of mobile use. The 13.4-inch screen is not huge but, boasting a 1366 x 768-pixel resolution, is highly detailed. We had no trouble reading spreadsheets and word documents. Colours are bright and vivid, making the laptop great for watching films on, although you'll need an external optical drive if you want to watch DVDs as the laptop doesn't feature an integrated one. The plastics the chassis is built from aren't the strongest and it feels a little flimsy to the touch. Durability isn't that great and we can't imagine this laptop would survive a lot of punishment on the road. This may be a consideration if you need to use the laptop 'in the field'. We found the keyboard pretty disappointing. It's large enough, but is poorly mounted and is very bouncy to use. The touchpad, on the other hand, is large and responsive and a pleasure to use. 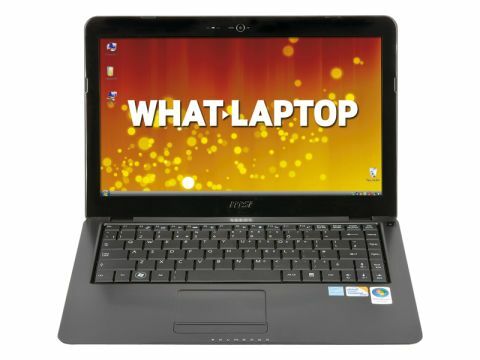 The MSI is powered by a single-core Intel Core 2 Solo processor with 2048MB of memory. Performance isn't great, but it works fine for word and data processing, only slowing down with serious multi-tasking. Multimedia tasks are out of the question however. The 320GB hard drive is more than generous and will provide room for all your files and folders for both work and play. A fast connection to both wireless and wired networks is provided by the builtin802.11a/g/n Wi-Fi and Gigabit Ethernet cards. HDMI and VGA ports make hooking up to digital and analogue displays easy but, with only two USB ports on offer, you will be limited to the number of peripherals you can connect. The MSI X340 proves itself to be something of a mixed bag. Its tiny size and weight make it a great ultraportable, but the poor keyboard, lack of an optical drive, and limited performance and USB ports let it down. However, its worth a look if your needs are simple.